With the advantage of having had many decades pass since these wannabee airplanes were developed, it is easy to see that there are a lot of familiar shapes and configurations that are recognizable in ones that were eventually mass produced. The Martin XA-22 (and the Boeing XB-17 for that matter), for example, is the spitt'n image of the AT-6 Texan, and the XB-39 is undoubtedly the inspiration for the venerable B-17 bomber. The Douglas XB-42 Mixmaster's profile reminds one a lot of the A-10 Warthog, if you ignore the powerplant differences. If you are a scale modeler looking for a new, rarely used subject for your next project, one of these planes might be just what you are looking for. In this month's issue Air Trails presents the second part of the Mystery Air Force in which little known attack planes and trainers are shown. There are some pretty interesting numbers such as the Stearman XA-21 which unfortunately crashed during demonstration; the Brewster XA-32 built by the manufacturers of the famous "Flying Pickle Barrel," the Buffalo; the Beechcraft XA-38 Destroyer designed around a 75-mm cannon and similar in shape to the well known twin-engine Beech; the North American XA-27 which is a dead ringer for the widely used Air Force trainer the AT-6, the ancestor of which it actually is. In the bombers we have the B-19A which just before the war was the largest craft in its class in the world. Stearman XA-21. Built in '40, was one of entries in design competition for multi-engine attack plane. Span 65', 2 Pratt & Whitney Hornets, 1400 hp each. Top speed 250 mph. Martin XA-22. Of same vintage as XA-21, later became the Maryland, used by French and British at beginning of war. Span 61' 4", 1200-hp Pratt & Whitney engines, speed 270 mph. North American A-27. Light attack bomber built in '38. Powered by Wright Cyclone 775-hp engine, span 42' 8", speed 250 mph. Features of plane were later incorporated in AT-6. 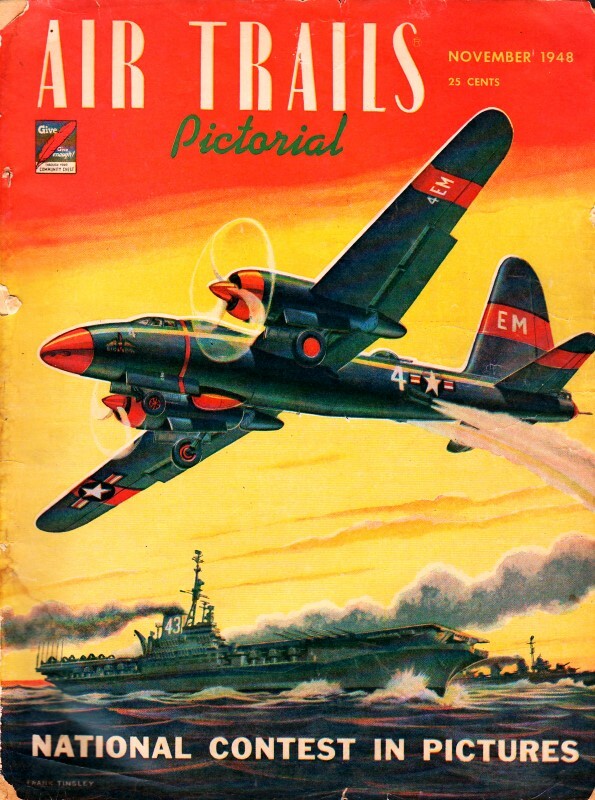 Douglas XB-19A. The famous XB-19 built in 1941, powered by four 24-cyl. liquid-cooled Allisons of 2600 hp instead of 2200-hp Wright radials. Wing span 212', speed 250 mph. North American XB-21 Dragon. A 1938 entry in bomber design competition at Wright Field. Only one built. Span 95', crew of six, engines 1200-hp Pratt & Whitneys. Douglas B-23. 38 were built, of which a dozen were converted to transport use and designated C-67. Very fast plane with top speed of 280 mph. Powered by two1600-hp Wrights. North American XB-28. Experimental medium bomber with pressurized cabin, remote control gun turrets. Wing span 72' 7", engines two 2000-hp Pratt & Whitneys, speed 370 mph. 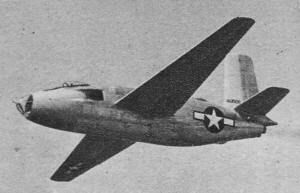 Douglas XB-42 Mixmaster. Formerly designated as XA-42, powered by two Allison engines, 1725 hp each, driving two contra-rotating propellers. Speed 410 mph, range 5000 miles. Douglas XB-43. Generally similar to the XB-42 except that power is supplied by two General Electric J-35 turbo-jet engines. Span 71' 2", maximum speed over 500 mph. 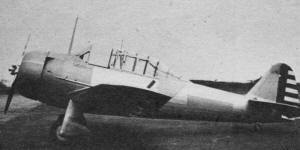 Fleetwing XBT-12. Two-place basic training monoplane. 25 BT-12's were supposedly delivered out of the order for 200. Had stainless steel landing gear. Span 40', engine 450 hp P&W. Boeing XBT-17. All-metal trainer, only one built, weighed 500 lbs. less than standard Army trainer BT-13, powered by same 450-hp P&W engine. Wing span 35' 9", speed 190 mph. Brewster A-32A. 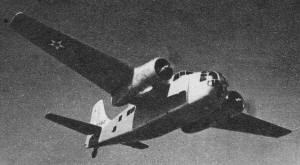 Single-place attack bomber with four 20-mm cannon. Only one produced. Wing span 45' 1", weight 19,800 lbs., engine 2000-hp Pratt & Whitney, speed 310 mph. Beechcraft XA-38 Destroyer. One 75-mm and two .50-cal. machine guns in nose, two .50-cal machine guns in belly turret. Powered by 2 Pratt & Whitneys, 2300 hp each, speed 375 mph. Consolidated-Vultee XA-41. Single-place attack bomber, designed to serve also as torpedo bomber. Wing span 54'. Powered by Pratt & Whitney engine of 3000 hp. Speed 360 mph. Consolidated-Vultee B-32 Dominator. Supposed to have been teammate of B-29. Few saw service in Pacific. Wing span 135', engines four 2200-hp Wrights, top speed over 300 mph. Vega XB-38. 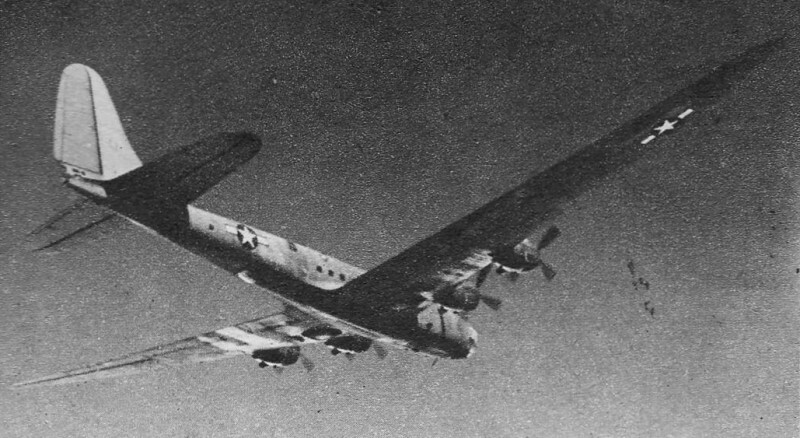 A Boeing B-17E converted by Vega Aircraft by fitting plane with four 12-cyl. Allison liquid-cooled engines, 1425 hp each. Plane weighted 4000 lbs. more than B-17E. XB-39. YB-29 fitted with four 24-cyl. liquid-cooled Allisons, 2600 hp each. Modification made by General Motors. Was first B-29 off Boeing production line. Used only for tests. YB-40. One XB-40 and 13 YB-40's were modified from Boeing B-17's to serve as escorts for bomber formations on long range missions. Had 14 cal. .50 machine guns in twin mounts. Fairchild XAT-13. Four-place bomber crew trainer of all-wood Duramold construction. Went through many modifications ending as AT-21 with Ranger engines. 600-hp P&W's. Boeing XAT-15. All-wood bombardier trainer, only two built, carried crew of four. Wing span 5' 10", weight 12,100 lbs., two Pratt & Whitney R-1340 engines of 600 hp, speed 200 mph. Noorduyn AT-16. A North American AT-6 with small variations built by Noorduyn in Canada for Royal Canadian Air Force. 1500 delivered, powered by 600-hp P&W engine. Federal AT-20. Avro-Anson II, all-wood advanced trainer powered by two U.S. Jacobs engines, 330 hp each. Wing span 56' 6", carried crew of five, top speed 150 mph. 50 built.